World (1955) and Olympic (1956) weightlifting champion - and holder of all the world records at the time - Paul Anderson, the subject of an excellent new book by Randall J. Strossen, Ph.D., was probably the strongest man who ever walked the face of the earth. One of the best known athletes of his time, no other strongman, before or since, has captured the imagination of the world the way Anderson did in the '50s and early '60s. He drew the crowds. As a member of the first U.S. sports team to visit the Soviet Union during the "Cold War," the 5'9", 363 pound Anderson thrilled the 15,000 strength-and-power-loving Muscovites - plus many more on television - who sat outdoors for hours in a drizzling rain to watch him trounce their champion. The Moscow newspaper the next morning called him "The Wonder of Nature." Upon returning home, he was summoned to the White House by then Vice-President Richard Nixon to receive congratulations and thanks for being such a wonderful ambassador for our country. In addition to making headlines in newspapers everywhere, he was featured on the Tonight Show and The Ed Sullivan Show, among others. America and the world loved the genial giant from Toccoa, Georgia. What impressed me (and many others) even more than his official lifts, however, was Paul Anderson's still unequaled prowess in the deep knee bend or squat. Outshining his historic performances in the Olympic lifts, Dr. Strossen writes, "[Anderson's] squatting ability surpassed anyone's wildest dreams...He was getting close to squatting double what the record had been before he assaulted it." 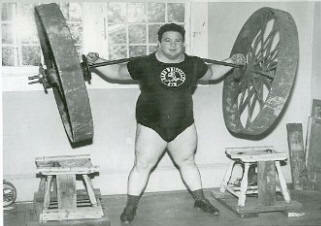 At a time when the world record was around 650, Anderson was doing 900 pounds for reps in exhibitions. He eventually squatted 1160 before reputable witnesses at Muscle Beach and again on The Ed Sullivan Show before a national television audience. Pressed for his all-time best, Anderson told Strossen, "I did 1200 face value with no reservations whatsoever." As to doubting Thomases, he said, "My squatting power was never challenged or no one ever disputed it after they saw me do, say, 10 reps with 800"--which he did many times as a guest lifter at early powerlifting contests. he improvised using iron wheels, as shown here, and other equipment that he made himself." "We had about 350 pounds on the bar, which was a lot of weight back in those days, and Paul wanted to try it. I said, 'Paul, you better not try this, you've never lifted and you might strain yourself.' I knew what the coaches would say if he got hurt or anything. Paul got up under the weight and squatted about ten consecutive times. I was aghast at that, and I said, 'Paul, you don't know how strong you are. If you concentrate on lifting weights, it's hard to tell how far you could go with it.'" Bob Peoples, a highly-respected Tennessee strongman, discovered Anderson about that time. He told of his first encounter with Paul in an article that appeared in the February 1953 issue of IronMan magazine. In a nice touch repeated throughout the book to convey the excitement and enthusiasm Paul generated at the time, Dr. Strossen reproduces the entire article, which was the first to tell the iron game fraternity that a new lifting prodigy was fast emerging. Peoples had heard reports of a big fellow who was squatting with 500 or 550, and asked that the man be brought to his gym so he could see him perform. Peoples was skeptical, because 550 was approximately the World record at the time. Here's what happened, in the words of Bob Peoples. "When they arrived, I lost some of my former skepticism for Paul certainly had the appearance of a superman. When asked what weight he wished to start with he replied, 'I'll start with 550.' We loaded it up expecting him to fail, but he performed two repetitions very easily with this weight....[What's more,] about a month [later] he came to my gym again, and this time accomplished a perfect squat with over 600 pounds." 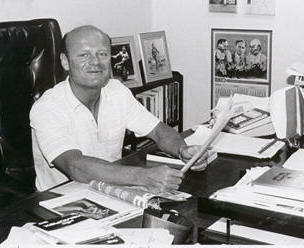 Bob Peoples and the weight lifting aficionados who read IronMan magazine now knew that Paul Anderson was a man to watch. But how did he get so strong so fast? According to Peoples' article, he did it by squatting all day, every other day. On the alternate day, he worked on the bench press and a few other exercises. He also drank lots of milk. Further on in the book, Strossen makes it clear that Anderson was an independent thinker; he had his own unique ideas about training. He believed that the squat is the most important of all the lifts, at a time when few experts agreed. In fact, the Russian and European lifters rarely if ever practiced squats. Squat racks were not standard equipment for Olympic lifters. In the foreword to the book, Tommy Kono writes that Paul created quite a stir in the training hall at the 1955 Munich World Championships by doing squats "with close to 700 pounds for ten reps without any warm-up and performed it so rapidly that it was as if free squats were being performed." Kono said Anderson would've used more weight, but that was all they could load on the bar. In an excellent chapter on Paul's training and diet, Randy Strossen writes that Anderson recognized early on that "the legs and back were the key to one's strength." As mentioned above, his early training was devoted mainly to the squat. "Paul combined short, intense workouts throughout the day, with periods of rest," Strossen writes. For example, he would do 10 reps in the squat with 600, rest for about 30 minutes, and then do a second set of 10. After another 30 minutes rest, he would increase the weight to 825 and do three reps, rest again and do two more reps with 845. Then he would rest again and conclude by doing half squats with 1200 for 2 or 3 reps and quarter squats with 1800. The whole routine took three hours or more. He would sip milk during the rest periods, consuming a gallon or more throughout the course of the day. Strossen, an expert on the training systems used by the Bulgarian and Russian lifters who dominated the Olympic lifting scene from the '70s forward, writes that Paul's training sounds "eerily prescient of what would become the structure of state-of-the-art weight lifting programs decades later." It is now well known that the "most productive national teams" train in a similar fashion, but in Anderson's time it was unheard of. "All told then," Dr. Strossen concludes, "from what he thought, to how he trained and ate, Paul Anderson's approach was consciously developed and planned, and taken together, was quite unlike anything seen before - as were his results." Like most people, I have neither the time or inclination--or the constitution--to train all day, every day, but I believe the take-home message from Anderson's training--in addition to the value of the squat as an overall body conditioner--may be to consider resting a bit longer between exercises to allow complete recovery before moving on to the next movement. That's what I've been doing since reading the Anderson book, and I believe it has allowed me to train with more enthusiasm and intensity. Give it a try and let me know what you think. 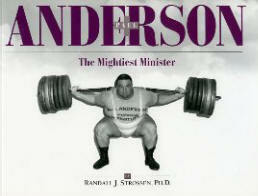 For much more about Paul Anderson, his times, his training, his Christian ministry--including his founding and support of the Paul Anderson Youth Home--and many wonderful photos of Paul throughout his life, from his childhood years (the early pictures give no hint of his strength potential) to his final days, read Paul Anderson, The Mightiest Minister by Randall J. Strossen, Ph.D. We have sold out of this book, but it can probably be found online - try Amazon. Order today! Dr. Strossen has produced a wonderful book. You'll love it, as I did. Ripped Enterprises, 528 Chama, N.E., Albuquerque, New Mexico 87108, Phone (505) 266-5858, e-mail cncbass@aol.com, FAX (505) 266-9123, Office Hours, 8-5, M-F, Mountain time. Copyright©1999 Clarence and Carol Bass. All rights reserved.